View More In Minidisc Recorders. Includes 1 Year EverythingMusic Extended Warranty FREE. Our exclusive warranty extends the manufacturers warranty (and it's policy terms) an additional year. You must purchase from EverythingMusic for this coverage. 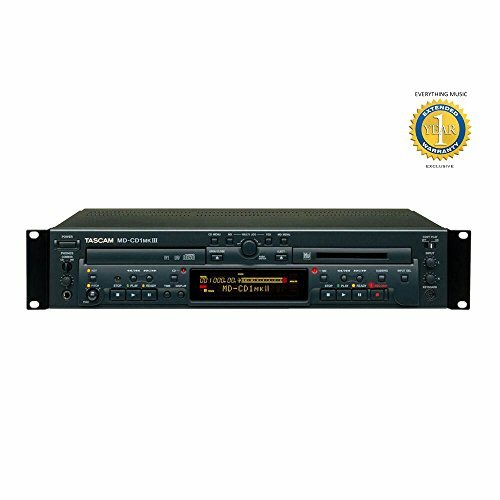 TASCAM's MD-CD1mkIII is the only combination CD and MiniDisc solution for contractors, broadcast and other installations requiring MD-format compatibility. Based on the bestselling MD-CD1, the new model adds new digital I/O, additional file playback from CD, an expanded pitch range for CD playback and more. For space-challenged jobs that need a variety of playback options, the MD-CD1mkIII is the perfect choice. The CD player on the MD-CD1mkIII supports MP3 and WAV file playback in addition to standard CD or CD-TEXT discs. The MiniDisc can play or record in all major formats: SP, MONO, LP2, and LP4. Discs can be dubbed from CD to MiniDisc at up to 4x speed, and continuous playback can cycle from one transport to the other. Both the CD and MiniDisc include Auto Cue and Auto Ready functions. On the rear panel, each transport has its own set of unbalanced outputs, plus coaxial and optical S/PDIF digital outs. The MiniDisc section has unbalanced inputs, coaxial and optical digital inputs as well. An optional balancing kit, the LA-MC1, adds XLR balanced I/O to the MD-CD1mkIII. It can be controlled using RS-232C, wireless remote control, or a PS/2 keyboard. Packing hours of playback in only two rack spaces, the MD-CD1mkIII is the ultimate solution for cramped installations requiring the flexibility of MiniDisc.